If you want an Apple Watch to keep track of your health, Aetna might help you pay for it. The health insurance provider announced on Tuesday it will subsidize the cost of the device for some of its customers. It will also let customers pay for the remainder of the watch’s cost through monthly payroll deductions. The company highlighted in a statement it will be the first major healthcare insurance to offer such a program, which begins this fall during open enrollment season. 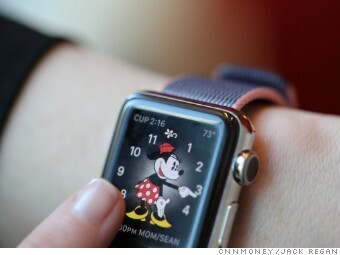 There are no health requirements to qualify for the smartwatch, an Aetna spokesman told CNNMoney. Employers who use Aetna decide if they want to offer the Apple Watch program to employees. The new Apple Watch Series 2 costs $369 for the aluminum body model and $549 for the stainless steel option. The Apple Watch Series 1 starts at $269. In addition to subsidizing the cost of the watch, Aetna will create several health apps for other iOS devices, such as the iPhone and iPad. The apps will be released early next year and focus on helping people manage their medications, long-term care and insurance plans. Apple (AAPL, Tech30) released a new version of its smartwatch earlier this month. Compared to the first generation, the Apple Watch 2 is geared much more toward fitness tracking. The smartwatch is water resistant, so you can swim with it, and comes with built-in GPS. This means you no longer have to bring a phone with you on runs — it’ll track your routes remotely. But unlike the Fitbit or Jawbone, the Apple Watch Series 2 doesn’t come with built-in sleep tracking. It’s a popular feature on other fitness devices and can help give you a bigger picture of your overall health. Using personal gadgets to track health for insurance purposes is a growing trend. A new study from Juniper Research has estimated that the number of individuals using mHealth information services market is set to exceed 157 million users by 2020, more than tripling the 50 million for last year. The new research, Worldwide Digital Health: Developed and Emerging Market Opportunities 2016-2020, forecasts that the adoption of mHealth information services will significantly increase as service providers roll out initiatives to tackle issues such as infant mortality and infectious diseases. SMS, Apps and IVR (Interactive Voice Response) services are providing vital information to those who cannot access general healthcare services. The research highlighted initiatives such as the MOTECH Foundation, which aims to implement preventative healthcare by educating the population on issues such as sexual health and pregnancy. Juniper found that limited access to connected devices and low literacy rates had resulted in many mHealth services being offered through contact centres. The research also argued that open source platforms such as Mobile Medic will act a game-changer for emerging markets over the coming years as healthcare workers seek more effective means of service provision in remote areas. The whitepaper, ‘Diagnosing Digital Health’, is now available to download from the Juniper website together with further details of the full research. The social network helps medical professionals collaborate on patient treatment. “The fifth leading cause of death is medical mistakes. Communication isn’t as free flowing as it should be,” Doximity chief executive Jeff Tangney told VentureBeat in an interview. Along with its communication features, Doximity also enables doctors to complete up to 20 hours per year of continued education through its partnership with the Cleveland Clinic. Doctors can read personalized articles and answer quiz questions to earn their credit. Although the company is best known as a “LinkedIn for doctors,” it has added several features key to its user base since launch, including secure messaging, personalized reading and research recommendations, recruiting tools, and an accredited continuing education program. It aims to increase cooperation between doctors by simplifying and streamlining communication and networking between them through the site. Since its last round of funding in 2012, Doximity has more than tripled its user base, with at least one in three U.S. doctors as members of the network — about 40 percent to be exact. Draper Fisher Jurvetson and T. Rowe Price Associates led the current round, with additional funding from Morgan Stanley Investment Management and current investors Emergence Capital Partners, Morgenthaler Ventures, and InterWest Partners. “For an early stage company, Doximity has demonstrated mature revenue and a clear path forward towards long-term success. Healthcare is not a niche, it’s a sector, and as a sector it’s incredibly large. It’s exciting to see Doximity bringing the best of social media to this significant market,” said T. Rowe Price Associates portfolio manager Henry Ellenbogen in an official statement. The company says it plans to use the funding to continue to grow, especially to include other medical professionals such as nurses and to grow internationally. It also wants to continue to build out the product and fulfill more of their users’ needs, such as verifying and displaying credentials, which are a huge pain problem for doctors, the company said. Doximity is one of the many “vertical networks” that have been emerging beyond the ubiquitous LinkedIn, from Edmodo for teachers to Avvo for lawyers and SpiceWorks for IT employees. Interestingly, LinkedIn cofounder and current Earlybird Venture Capital partner Konstantin Guericke has been on Doximity’s board for about two years. “One thing that was exciting [about Doximity] has been the fact that this really impacts the lives of people,” Guericke told VentureBeat. Guericke also said that Doximity’s focus on a single industry allows it to build a product very tailored to that group’s needs, providing more value in areas more general networks such as LinkedIn cannot. Although he doesn’t believe LinkedIn et al. will go away, he does think professionals will be spending more and more time on their respective vertical networks. Guericke also pointed to marketplace verticals such as Zillow for real estate and Elance for freelancers, which he believes offer better values than, say, general purpose marketplace Craigslist. “Focusing on one area you can do a much better job,” he said. Doximity is not the only player in the medical social network field. QuantiaMD, which launched in 2004 and has raised a total of $63 million, is also a social network for healthcare professionals aimed at increasing collaboration on difficult cases and learning from peers. Doximity was founded in 2011 by Jeff Tangney and Nate Gross, and is based in San Mateo, Calif. This new round brings the company’s total to $81.8 million. With $54M, Doximity’s LinkedIn-for-doctors will add service for nurses, go international | VentureBeat | Deals | by Kia Kokalitcheva.